One of the most fascinating stories of the last year has been the evolution of Amazon Prime. In exchange for a recurring fee, you get access to a huge, varied media library: movies, TV shows and books. And yeah, some of that content isn't all that great, and even more isn't stuff I would choose, but a lot of it is amazing. And yeah - I can't access all of that content on any device I want, but most of it I can, and the range of those devices, especially for digital video, is growing. But the original genius of Prime was grouping together three values: membership, exclusivity and instant delivery. By paying a premium, you became a VIP in an exclusive club that got access to some things faster than other people could. Oh, you've got to wait five to nine days? I can get that overnight. And by putting those pieces together, wrapping them together with services, Amazon helped bind its customers to its platform. They weren't just online shoppers; they were Amazon Prime members. Amazon is in a position to do this because they've built up the infrastructure, on the ground and in the cloud, to deliver it to your house. And nobody really has a problem that Prime members get faster delivery than non-members; they've paid the money, and you could join up too. Or you can wait a little while and get what you've paid for a little bit later. That subscription model has proven so powerful that nearly every notable media startup has adopted it in one form or another: Netflix, Hulu Plus, Spotify, Rdio, Pandora, etc. (These services too are regularly chided for having incomplete or disappointing content.) Even Apple, who usually can do no wrong in bloggers' eyes, is regularly cajoled to offer up a subscription-based music service, or TV, or movies, or anything besides iTunes Match. The only fever dream Piper Jeffrey analyst Gene Munster holds dearer than an integrated Apple TV set is an Apple television subscription service. And he's not alone. This is all to say that in the last decade, we've been steadily rediscovering the virtues and working to recreate a model that's existed for a long time, which is vastly more popular than anything comparable that began on the web, and which we kvetch about endlessly. Most of us want cable TV or something very much like it. We just refuse to admit it. Even those of us who say we don't want or need cable find ourselves filled with longing when cable and cable alone offers something new - this week's Mad Men premiere, "Linsanity," or a new season of HBO's Game of Thrones. We want to have those experiences; we want to be part of that conversation. Many of you have probably seen this cartoon from a popular strip by Matthew Inman called The Oatmeal, titled "I tried to watch Game of Thrones and this is what happened." The protagonist has just read the book series, can't find a way to stream or download the first season of the show legally, so he pirates it instead. Many of you probably also read MG Siegler's "Help! I'm Being Forced To Pirate Game Of Thrones Against My Will!" which appeared a few weeks later and basically lifts the same argument, rewriting in blog post form (with a tiny, non-attributive link) - just about the now-airing Season 2 rather than Season 1. Both Inman and Siegler make the same points. They want to watch Game of Thrones. But they don't want cable. And importantly, they don't want to wait. At all. Because you can totally watch Game of Thrones without cable - if you're willing to wait. In Inman's case, Game of Thrones Season 1 came out on DVD and Blu-ray, and then digital download, within a couple of weeks after he published his post on February 20. Inman himself notes this on his blog - although he says the incident he describes happened earlier and stands by his general point about piracy versus availability. (Inman even includes an affiliate link to buy the discs from Amazon - good on him.) Siegler is even less patient than Inman; he bought Season 1 on iTunes and wants to watch Season 2 immediately in the same way. Because he can't - or rather, "because of the aforementioned naughty cuddling deal HBO has with the cable companies" - he says is being forced to pirate new episodes of the show. I'm not about to deny that piracy is easy or that it's inevitable, because it is clearly both. I'm not even here to argue that piracy is immoral. Seriously, even if you read The Oatmeal, it covers that ground pretty well. What bothers me is Siegler's notion that his turn to piracy suggests that HBO and the cable companies' business model is wrong - whether economically or morally. Subscribe to cable and HBO. Heck, cancel after the season ends if you want to. Back in the day, when video piracy was still pretty hard and HBO original series were way better than they are now, we used to do it all the time. Wait for the season to end so you can buy the discs from Amazon, rent them from Netflix, or buy the digital files from iTunes. Let's call this the "Amazon Super Saver" approach. You save money, you get only what you want and what you've paid for - but you have to wait longer than the Amazon Prime folks who've paid for their subscriptions. But then you get to binge on the whole season at once! Not that bad, really. And no different from waiting for a movie to leave the theaters and come out for home purchase. There's a reason they call it "Home Box Office," after all. Watch the shows at a friend's house. Do you have friends? Do they like the same things as you, but like watching a lot of TV a little bit more? Find them. Ask them if you can come over. Maybe offer to bring some beer or wine. Might even be better than watching an HD .mkv file on your laptop all alone. Really, what the pro-piracy arguments come down to - at least in the United States, where most content is pretty ready available (a few exceptions aside) - is "this is legally available, but not at a price I am willing to pay," and/or "this is legally available, but not for a time that I am willing to wait." Or rather - "I insist that you immediately provide your content at a price and on a device or devices of my choosing." This is a newly emerging and oddly curious expectation towards media. And, in an equally curious bit of irony, it's actually the universe that services like Amazon Prime have encouraged us to believe in. How would you price that? This is one of my favorite games. Anytime anyone says, "I wish that company X would offer pay service Y without complication Z," I ask them, "what would you pay for that?" Typically, the other person hasn't actually thought it through all the way from "what-if?" service to actually-existing, would-you-actually-spend-so-much-money-on-that? product. About a year ago, I did this for subscription-based access to the full contents of every book ever published on any device. I argued that I would pay $100/month for the digital version of Library of Babel. Most people I spoke to on Twitter as consumers thought that was way too much. To me, looking at what I pay for my digital voice and data plans alone, it still feels remarkably low. Lately, I've been having similar conversations about HBO. I did this about a month ago on Twitter with Chris O'Brien, who writes about business and tech for the San Jose Mercury News, and who would also rather pay for HBO without a cable subscription. How much would you pay for cable-free HBO? I asked. I'd say O'Brien's response is pretty typical. On its face, this seems pretty reasonable, particularly when (as O'Brien points out) you think about HBO trying to compete with Netflix, Hulu Plus, and the like for standalone video. But when you break it down, there are actually really good reasons why HBO is that cheap when bundled with cable, and why it would have to be a lot more expensive if sold stand-alone to individual subscribers. First, to say Comcast buys HBO in bulk is an understatement. Other cable companies, too, (and satellite and AT&T/Verizon/other telecoms doing video) have profound purchasing power. They also heavily promote HBO to their hundreds of millions of customers. So HBO gets a lot more from Comcast for its $7.27 (or whatever it is Comcast might pay) than it would get from me or you for our $10. HBO costs $10 per month because it's bundled. It's not the fair market price. Untie that knot, and you have to untie everything. HBO is never going to let itself be priced at anything but a premium relative to Netflix and Hulu Plus. (Starz has way less cachet and much less to lose than HBO, and still walked away from Netflix negotiations rather than dilute its brand.) And HBO is never going to dynamite its multi-decade relationship with cable companies unless individual customers were willing to make a Godfather offer. 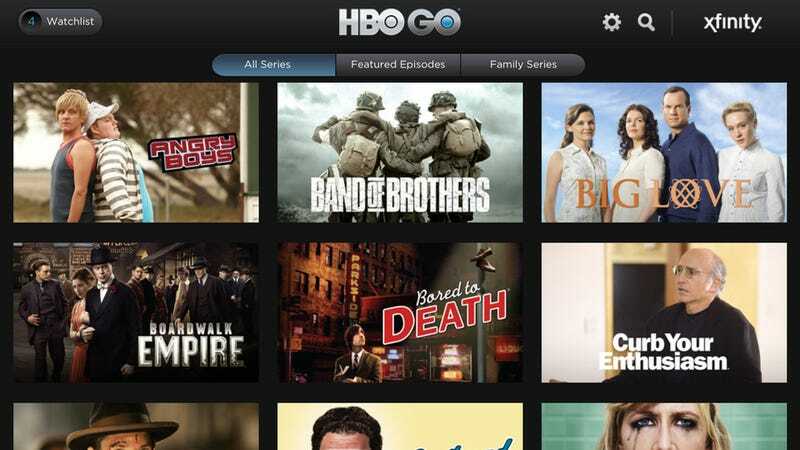 To my mind, the bidding for standalone, web-delivered HBO and HBO Go starts at $20 per month. And to my mind, at that price, you'd see pretty substantial adoption - when you add in the back content and multi-device support, it's really a pretty amazing deal. But I think you'd also see the same cast of suspects claiming that HBO's business model is all wrong, that it's forcing them to pirate their favorite shows, that they shouldn't have to pay for True Blood when all they really want is Game of Thrones, that HBO should really be giving away their content for free and looking to monetize its users in other ways, etc. This loop is endless. It's a silly assumption to think that HBO's primary concern is preventing piracy. I don't think it is. It doesn't matter how much piracy occurs at the margins. The company can tolerate that. Because cable television and premium pay cable isn't actually in trouble. It's still the most popular form of home entertainment in the country, bringing in millions of dollars. You want to pirate Game of Thrones today and turn around buy the Blu-ray tomorrow, blogging about how much you love it in between? No problem. That's like throwing Brer Rabbit in the briar patch. This is not a radical act. And you are not dealing with the music labels here. This industry is not going anywhere. It's a pretty darn good buy, the bundle of product you receive for about forty dollars a month. You get in excess of a hundred channels, each with twenty-four-hour entertainment. If you buy a cup of coffee for four bucks and add a sandwich, you get to ten bucks, then drive across the George Washington Bridge, where the toll is eight bucks-these are everyday things that you don't even think twice about. Like if you take the family to a game or go to the movies, you're going to spend far in excess of what is asked for cable television. I believe cable is perhaps the greatest bargain in history. Our real problem with cable is not the idea of cable, paying $100 per month for an unprecedented amount of bundled entertainment. Our problem with cable is cable as it actually exists. Our problem is with bad service, local and regional monopolies, crummy interfaces, waiting in line for hours to return a stupid set-top box before we can leave town and move somewhere else to do the same dance all over again. We've become so frustrated and paralyzed by these problems, they've come to seem so inevitable and intractable, that we've largely stopped talking about them. Instead, we talk about other things - business models, technology companies, disruptive startups - that just might possibly get our real problems, with our service and with our experience, to change. What cable companies and their customers really need isn't Apple marching in to tell programmers they're going to sell their content à la carte now, because some Very Serious People on the internet would really enjoy writing about that. They need Apple and Google and Microsoft working with them on how they can make their existing services work better. They need Verizon and AT&T offering video and voice and internet that are at least just as good at competitive prices in the same cities and neighborhoods. They need to continually find ways to make their own products and their own technology better, catching up to where consumers are today: using the living room for something other than television, and watching TV content on screens that aren't anywhere near the living room. Psst: What we need is what's already happening. This is amazing. Just keep watching.